Day Three (08.25.09) As the sun started to set, bright oranges and yellows stretched across the Coachella valley. The strong shadows created depth and empahsized the sea of windmills that began to surround us in all directions. Dave and I were cautiously scanning the road ahead to spot the giant dinosaurs, not quite sure where along the interstate they were exactly. I think we listened to the campy single 'Send Me An Angel' about 10 times in a row just so that it would be playing when we finally did spot them on the horizon. 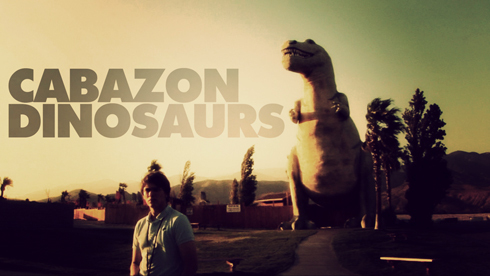 Made popular by The Wizard and Pee Wee's Big Adventure, you get the feeling from those movies that the Cabazon dinosaurs are a roadside tourist trap standing in the middle of a blank desert. This isn't the case anymore. Cabazon has expanded around them, and not only is the area landscaped now, but there's a Burger King right out front. When we finally did spot the dinos we didn't have an exit to take so we had to to make our way back again. It actually created a great reveal because of how the sun silhoutted the T-Rex. Call it childish, but I was pretty excited to see those giant tourist traps. 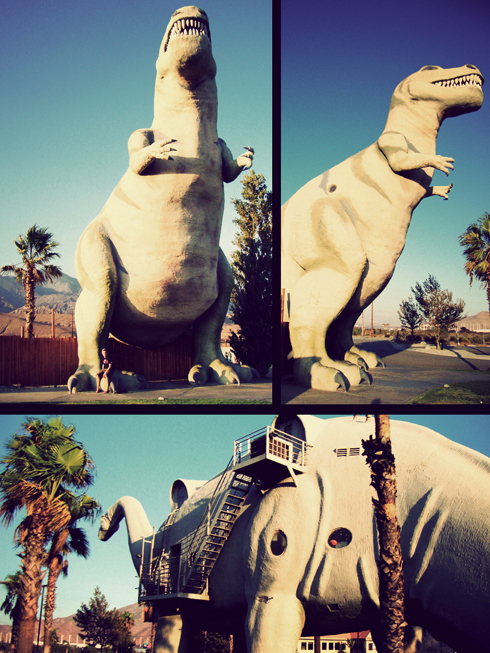 Our stop at the dinosaurs was brief, but somewhat surreal. This had been an image that I'd had in my head for quite a while leading up to the trip, so to finally see the landmarks in person I was able fill in the blanks left by my imagination. We took pictures, some of the best from the trip of ourselves, and generally just wandered around to let the moment sink in. 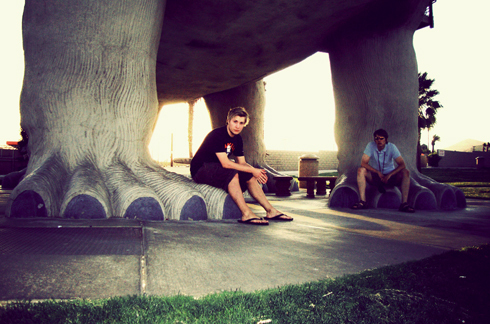 Since the gift shop inside the Apatosaurus was closed, we made plans to return the next morning on our way to Newport Beach, which would also give us a view of the dinosaurs in a new light. The revisit also lead to Dave buying a rubber T-Rex head puppet. It came in handy, allowing me to make more of a scene when I wanted to poke fun at Dave for hitting the rumble strips on the edge of the highway. Regardless of how much time had been spent in the car, there were a lot of reasons to celebrate at this point. Indio was just around the corner. We'd made it.